The article provides facts and information about Crow land. The Native Americans including the Crow tribe had never developed a system of private land ownership like the European settlers. Native Indian land was not owned by individuals. It could not be sold. Crow land therefore belonged to the whole community. But there were tribal boundaries. Crow land was recognised by the settlement of the tribe within the boundaries of their territory. The Crow (the Bird People) are a Siouan-speaking North American Plains Indian people originally from southern Montana, U.S. The traditional territory of the Crow tribe was the area around the Yellowstone River in what are now northern Wyoming and southern Montana. The Crow migrated westward until they reached the Rocky Mountains. 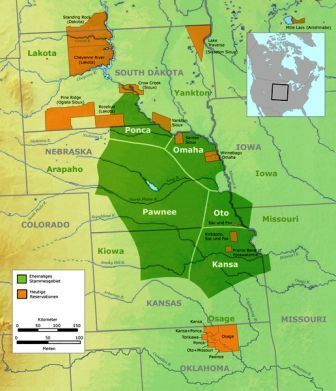 The land that became home to the tribe were the Great Plains Indians shown on the Great Plains map. The Crow became nomadic buffalo hunters after migrating west from the Missouri River in North Dakota in the 18th century. This area was occupied by the tribe before the arrival of the Europeans. The Crow had never experienced the way of the Europeans especially in relation to the subject of Land Ownership. The ownership of Crow land became the source of the bitter conflicts with other Indian tribes. The Crow Native Americans lived in harmony with the land which was emphasized by the their culture, religion and beliefs. The idea of an individual person having exclusive use of a particular piece of land was completely alien to Native Americans. The Crow fought, as communities, with other tribes over hunting rights to their territory. But the "right" to the land was very different from the legal terms understood by the white settlers relating to individual ownership. The Crow Indians had no concept of "private property," as applied to the land. The American Indian Wars is the name used in the United States to describe a series of wars, battles and conflicts between American settlers or the U.S. army, and the Native American Indians before and after the American Revolutionary War. The Crow were at constant war with the Blackfoot and Sioux and sided with the U.S. military in the Indian wars of the 1860s and '70s. The Fort Laramie Treaty of 1851 confirmed a large area centered on the Big Horn Mountains as Crow lands. In 1868 the Crow tribe accepted a reservation carved from former tribal lands in southern Montana. The Crow tribe now live on a reservation south of Billings, Montana and in several major, mainly western, cities. Crow descendants numbered some 15,000 in the early 21st century. The Dawes General Allotment Act was passed by Congress in 1887 which led to the break up of the large Indian Reservations and the sale of Indian lands, including Crow lands to white settlers. 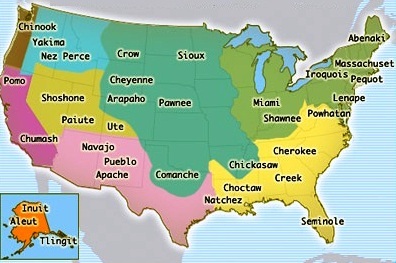 The Crow Native Indians, together with the other Native American tribes, were settled on reservations. In 1969 when all Indians were declared citizens of the U.S.
Crow Land. Discover the vast selection of pictures and videos of Native Indians. The pictures show the clothing, weapons and decorations that can be used as a really useful educational resource for kids and children of all ages. Our series of videos enable fast access to the images, pics, paintings and pictures together with information and many facts. We hope that this article on Crow Land will assist in your studies or homework and that you will enjoy watching the videos featuring many pictures of the Native Indians. A great educational resource for kids on the subject of Native American Indians including the Crow tribe.